Brugmansia arborea, the Angel's Trumpet occur naturally at high altitudes in Asia and South America. It is a small tree-like shrub, growing to 4-10 feet tall. It is closely related to Datura, belonging to the same nightshade family, solanaceae. Brugmansia blooms dangle like great trumpets or bells while Datura blooms stand erect. Brugmansia arborea is common in cultivation and is very ornamental. Brugmansia may be grown in containers or in the garden. Known for its velvety creamy-white trumpet-like flowers which are 6" long, nodding but not completely pendulous. Very fragrant in the evening. The angel trumpet blooms for an extended period in flushes from early to mid-Summer through Autumn with several flowering cycles. Container-grown plants moved indoors for the Winter may bloom during those months. The leaves are green, velvety, 8 inch long and in pairs. 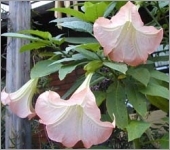 Brugmansia arborea are toxic, all parts of plant are poisonous if ingested. The fruit is spineless, 2.5 inches long. The stem is erect and branching.